This painting is for sale on my Daily Paintworks Site! Please click here to view and purchase. I had to set this painting aside for a bit as I wasn't happy with it. After letting it sit for a week or so without looking at it, I took another look and decided that it wasn't as bad as I thought! Funny how that works. It isn't perfection, none of them are. All of my art is very much a work in progress. 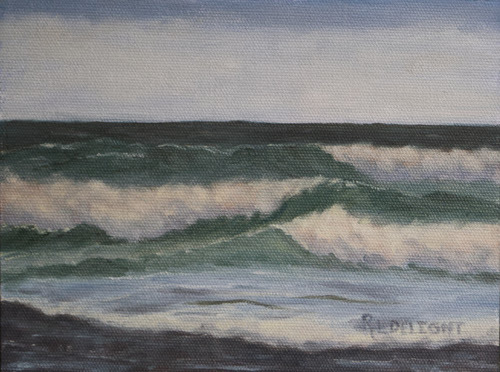 This particular painting day was all about the shape of the waves and the beautiful colors. The waves were not particularly large but still very interesting. This was painted in the early afternoon on a Fall day. The weather is taking a turn toward winter. This week the arctic air is sliding down from the north with strong winds and the possibility of snow on the beach. It will make for some very interesting painting! Please do visit my Daily Paintworks site when you have a chance. All of my paintings for sale are on it. My website has all that and more as well. Don't forget! If you purchase a painting, or if you refer someone who purchases a painting, you will be entered into my drawing for a 12"x16" painting that will be completed after the workshop. Cold is right, that arctic air mass has cooled us down to 5 degrees this morning. Snow on the beach should be interesting for painting, but I bet you'll want to work fast. Dress warm!